Bandarban district is in the south-eastern part of Bangladesh under Chittagong division. Nilgiri Hill Resort is located about 47 km south-east of Bandarban. It's the highest Hill Resort in Bangladesh about 2400 ft high from the sea level. Cloud of the sky often kisses the peak of the mountain. People can touch the cloud from the resort. Gentle breezes always blowing down the hill that makes a sweet sound deflecting in the mountain trees. At night the light of the moon, cloud and breeze creates an imaginary environment. From 15 to 20th September we visited Rangamati, Khagrachari and Bandarban of Chittagong Division. I had visited Rangamati and Bandarban before but unable to see Nilgiri. This time we visited Nilgiri (নীলগিরি), Chimbuk Hill (চিম্বুক পাহাড়), Shoilo Propath (শৈল প্রপাত), Nilachal (নীলাচল), Meghla (মেঘলা) and Sorno Mondir (স্বর্ণ মন্দির). I have a plan to write about other places as well but for now I am focusing only Nilgiri. 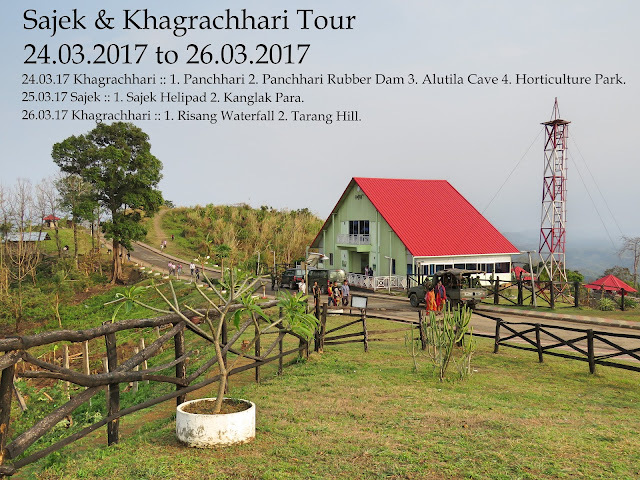 We started from Bandarban Alikodom (আলীকদম) and following the road of Thanchi (থানচী) within one hour we reached in Nilgiri. It was 19th of September. Though we had a car but we hire a Chader Gari (Local Transport) to go Nilgiri. The rent differs depending on the season. During pick-season it becomes difficult to rent-a-car. As it was an off-pick season we manage it quite easily. The car rent is approximate 2500 to 6000 per day depending on the demand. Marma Reesa is a duplex lodge and also known as Honeymoon Lodge. Random pictures of Nilgiri. Sitting arrangements for the mountain viewers. An awesome place to enjoy the natural beauty. Top right picture is the hotel called Hotel Hill View where we passed two night. During off-pick season the hotel rooms are very cheap but in pick season it becomes difficult to get a room. We also eat the famous Papaya of Nilgiri that was really delicious. Better you use your own private car or rent-a-car. In case you don't want to do it you can go from Dhaka to Bandarban by bus or 1st go Chittagong by bus / train / by air and from there use bus to move Bandarban. Bandarban to Nilgiri use rent-a-car (called Chader gari / চাঁদের গাড়ি). Chader gari is better because the car has to climb the hill. It is not easy to get a lodge or cottage in Nilgiri. Most of the time they remains booked. Army man gets the priority for booking. So if you want to spend a night there try to contact the authority before three months. In case of short visit you can stay in Bandarban, start early morning and spend your whole day there. We stayed in Hotel Hill View. Though we had a car we use rent-a-car to visit Nilgiri. On the way we see Chimbuk Hill and Soilo Propath as well. Nilgiri (নীলগিরি), Chimbuk Hill (চিম্বুক পাহাড়), Shoilo Propath (শৈল প্রপাত), Nilachal (নীলাচল), Meghla (মেঘলা) and Sorno Mondir (স্বর্ণ মন্দির). Keokaradang (কেওকাড়াঢং), Sangu Bridge (সাংগু ব্রিজ), Prantik Lake (প্রান্তিক লেক), Rijuk Waterfall (রিজুক ঝর্না) etc. Nice article. It makes me feel that I am literary visiting that place. Nice piece of work. Keep it up. Your photos of Nilgiri Resort are excellent. You have created an informative article. Carry on and thanks.